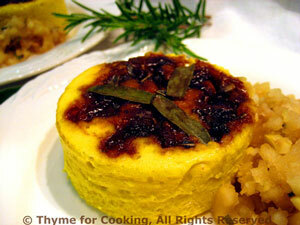 Butternut Squash Timbales, with Apple Sauce, Thyme for Cooking gourmet. Apples and butternut squash make this a very autumnal dish. If you have sage in your garden, use them to make the design, if not just leave off. Peel butternut squash using potato/vegetable peeler. Cut it in half the long way (blossom to stem) and remove seeds. Cut cubes, 1/4" (.5cm), until you get one cup. Wrap the remainder in film and refrigerate. Put cubed squash into a steamer basket over boiling water and steam for 10 - 12 minutes, or until tender. Remove and put into a bowl. Add the pinches of salt and nutmeg. Mash the squash with a fork and mix well. Put the egg in a medium bowl and whisk lightly. Add yogurt and whisk well. Add the squash and stir well to combine. Heat 2 tsp olive oil in nonstick skillet over medium heat and add shallots. Sauté 10 minutes, until starting to brown. Add water (it helps speed things up and prevent burning) and stir well and let continue to cook for about 20 minutes, stirring occasionally, until nicely browned. Add brown sugar, vinegar, herbs, and cook, stirring for 2 more minutes. Peel apple and chop finely. Put apple in a small saucepan with 1 tbs water. Heat over medium-low until apple is soft, about 15 minutes. Add sugar, herbs and heat through. Butter 2 ramekins and line with buttered parchment or waxed paper (see techniques). Make 2 more circles and butter one side for the top. Put 3 sage leaves upside down in each ramekin. Top with the caramelized shallots, evenly divided. Spoon the squash on top, dividing evenly. Put the paper circle, buttered side down, loosely on top. Put ramekins into a baking pan (I use a bread pan) with deep sides. Pour hot water into the pan coming half way up the sides of the ramekins. Bake in 400F (200C) oven for 30 minutes, until set - top will be firm. Remove from oven and carefully remove ramekins from hot water. Remove paper. Run a knife around edges of timbales and invert onto small plates. Remove paper carefully. You should have a lovely top of 3 sage leaves nestled into the shallots. Spoon Apple Sauce on the side and serve.